Looking to rent a capable 525 gallon water trailer in Rochester, Ithaca and Upstate NY? 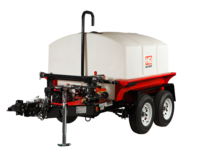 The Duke Company rents the Multiquip WT5C water trailer that is capably manufactured for a range of jobs including dust control, emergency fire fighting, construction projects, agriculture and a host of other applications. The 525 Gallon tank is constructed of durable polypropylene and rests on a solid, double-axles trailer with electric brakes. The high flow Multiquip QP2H centrifugal pump is very capable for both suction and discharge. Pump: powerful Multiquip QP2H 2 inch centrifugal pump. The Flow / Head: 158 GPM / 115 ft.
Switch: easily switch form suction to discharge by using a single manifold lever. Spray Bar: rear spray bar has wide coverage. Choose the pressurized or gravity feed setting. Safe Transport: towing and braking is enhance via the dual axel trailer and hydraulic braking system. The trailer is DOT certified to 3,500 pounds. Hose Kit: equipped with a 2” x 20’ x 50’ discharge. Accessories: include hoses, couplers, nozzles.